I knew the Queen Charlotte Track (QCT) was going to be a well groomed and an easy track to walk but I didn’t realise just how much of a tramping highway it actually was. The whole track is basically like a narrow vehicle track for the most part. Very wide for tramping and besides the odd up and down, follows around hills on the contour. Easy walking and it made for a super fast pace. Looking down from the track through the greenery there were views aplenty. Bright turquoise coloured waters were calm and sheltered yachts in just above every cove along the way. Big vistas right across from bay to bay from the ridge tops. 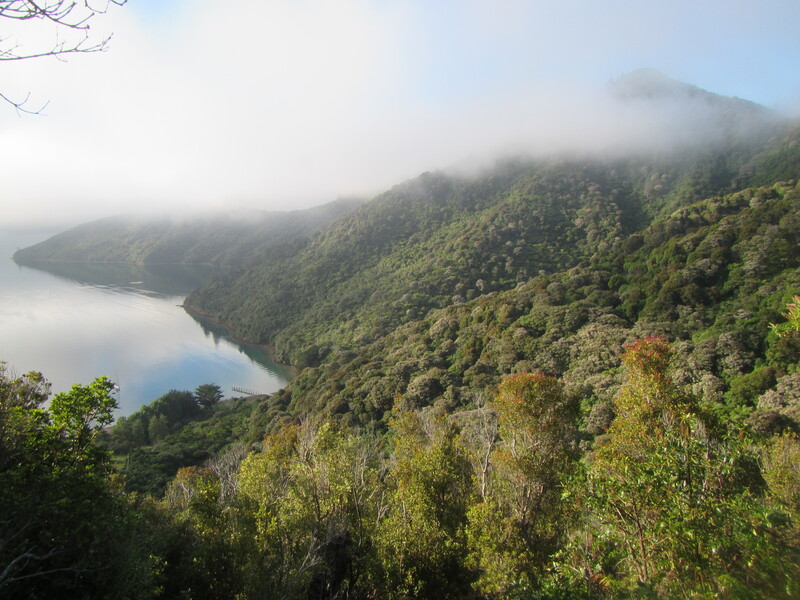 The track wound around from Schoolhouse Bay, Resolution Bay into the top of Endeavour Inlet and around to Punga Cove and Camp Bay. Along the way the trail cuts across private property in a few places and the QCT is one of the only sections along Te Araroa that requires a permit. It should come as no surprise that the private property sections lined the water front for the perfect vantage points and sheltered coves. Most are holiday homes or baches but there are some residents who choose to live along the shores. There are no roads and all access is by boat only. Part of the attraction of the QCT for the average punter is being able to walk the track and stay in one of the many private accommodation venues along the way while having your pack shuttled from your start point to your end point each day by water taxi. No such luck for me. I would be carrying my pack all the way and utilising the camping sites. Carrying a pack didnt really slow me down any and I passed a heap of pack free weekend warrior trampers along the way. The quality of the track allowed me to fly along and I reached Camp Bay around 2:30pm. Very early to make camp. Under ordinary circumstances, if I arrive somewhere by 2:30pm I’d push on for at least another 2 hours and hopefully another 8 km or so. I had a couple of options today. 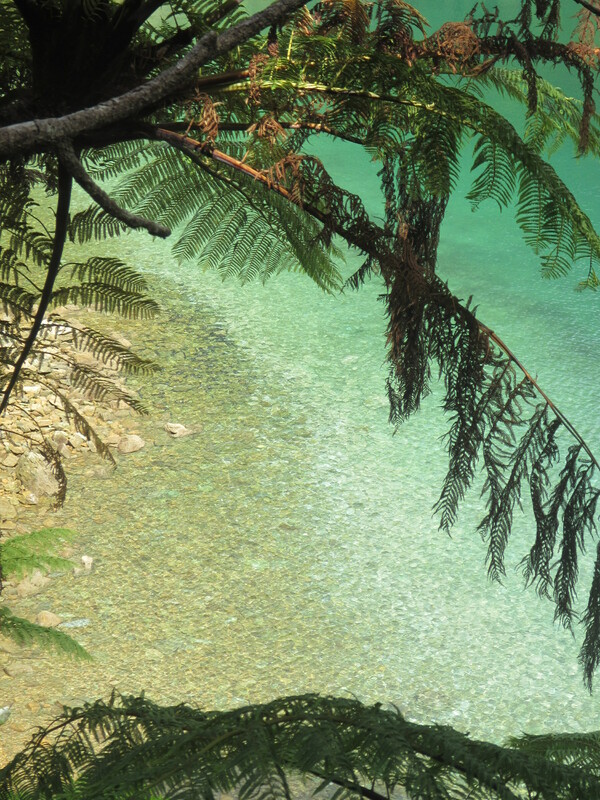 B: take my time, settle to stay at Camp Bay, go for a swim and head to Punga Cove, 5 mins away for a refreshing beer. Easy decision really. Option B it was. I have all week to reach Nelson and pressing on any further would have me finishing the QCT in a day and a half, and then having to fill in my time or reach town much earlier than expected. I’m meeting Jacinta in Nelson on Friday evening. Camp Bay must be a popular location as DOC have a Camp Host here to make sure people are doing the right thing and collecting stats on who is using the facilities. This week the host was David, a very friendly and likeable fella. He’s here for two weeks before heading to Stewart Island, lucky bugger. After a quick introduction and look around the campsite I was off for a refreshing swim. The water was great. Calm, crystal clear and nice to be able to cool down and scrub the sweat away, even if it was in salt water. But a fresh water creek ran into the sea and it wasn’t too bad. Layers of cold and warm water were easy to find and locate the perfect temperature to just sit down up to my neck and laze in the shallows. Very, very calm. No a single wave. 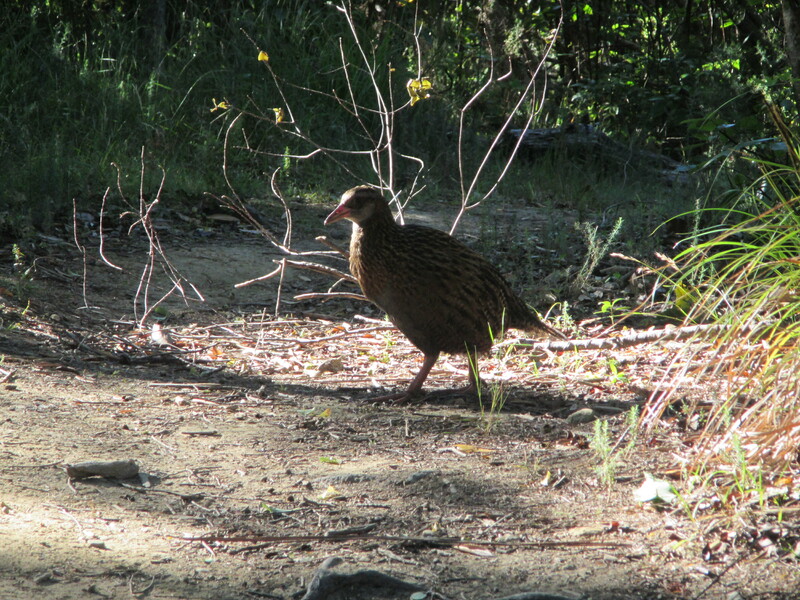 I’d got my camp set up and all my gear secured from the infamous Weka, a native flightless bird that moves with stealth around camps looking for any loose bits of gear, that they then grab and make a bolt for the bush with. There were a few lurking around my tent but I had everything inside my pack, inside my tent. Only 5 minutes away was Pungua Cove, a mini, cheap holiday resort, sporting a cafe and bar. I was starving, tummy grumbling, having not packed as much food as I thought I would need and quickly made my way over. I grabbed a 500ml Porter beer which hit the spot and ordered the worse $18 nachos i’ve ever consumed. They were terrible but I ate them none the less. Hunger called. I caught up with Andrea and Mario as I went about cooking dinner in the shelter and met a few other people just walking the QCT. The QCT is jam packed with people just hiking the from Ship Coves to Anakiwa and I would be sharing the trail with them to Anakiwa over the next couple of days so it’s great to met them. There were a lovely young Swiss couple, Silva & Martin, incredibly friendly from the get go and a group of 3 Germans. Conversation flowed easy with the Swiss as we cooked dinner and I was treated to some real Swiss chocolate for desert. The German group, well, not sure what they were doing out here. They didn’t seem to be enjoying it or know how to camp really. One of them, we’ll call him Blondy, was bitching and moaning about everything – an amateur for sure. He couldn’t work out how to cook a Backcountry Cusine meal and I tried to show him how but he didn’t want to hear it and ended up dumping the contents into his pot and trying to cook it on the stove, and kept complaining how bad his meal was with every bite. We wouldn’t let him bring the mood down though and all took turns taking the piss out of him (for non Aussies – mocking, riling, joking). Like so many conservations with new people, everyone was keen to hear about the Te Araroa and find out exactly what Mario, Andrea and myself were up to. None had heard of it. The German jerk trying to tell us we were mad and could not fathom why on earth anyone would want to do such a thing – “so long, such a hassle, so uncomfortable.” Your life mate – so boring. Each to their own I say. David, the camp host was great and had many questions about the trail and the gear I was carrying. I was only too happy to oblige and can talk gear with anyone who is interested for hours. Hope you get a chance to get out and pick off a section or two David.